Our Sun maybe waking from a deep slumber, for a while at least, so far in 2018, our Sun has recorded 18 days (50%) which have been sunspot free and the ones that made a show were small and posed no threat for strong solar flare. 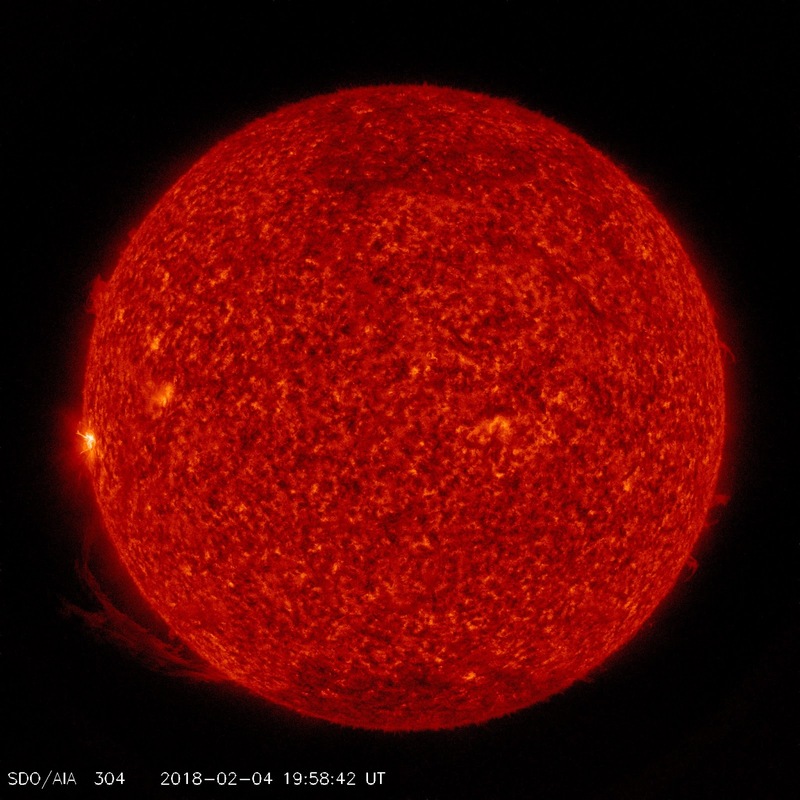 A new sunspot (AR2699) is rotating into view over the sun's eastern limb and it has announced itself with a flurry of B- and C-class solar flares. 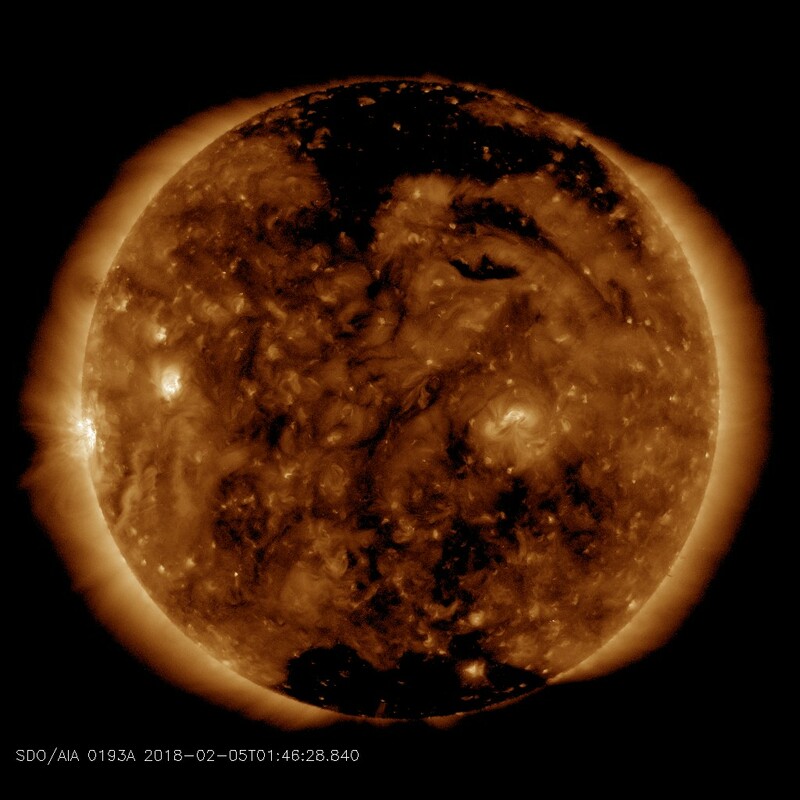 NASA's Solar Dynamics Observatory caught one of the explosions coinciding with the liftoff of a giant magnetic filament at 19:58 UT on Feb. 4th. According to Spaceweather.com, these flares are relatively weak and would probably escape notice during a more active phase of the solar cycle. However, we are now on the eve of Solar Minimum. C-class flares, albeit "weak," are sharp departures from months of tomb-like quiet on the solar surface. The last time we had a biggy was way back in September 2017 when an X9.3-class solar flare-the strongest solar flare in more than a decade EXPLODED from giant sunspot AR2673. In all AR2673 produced 4 massive X-Class flares. We have to go back even further back to the next one in May 2015 when sunspot AR2339 produced an X-2.7 Class. A stream of solar wind spilling from a northern coronal hole in the sun's atmosphere is grazing Earth's magnetic field today. This could cause geomagnetic unrest and auroras around the Arctic Circle. Of the 15 major quakes which have occurred this year, 14 of them happened during the influence of a coronal hole.